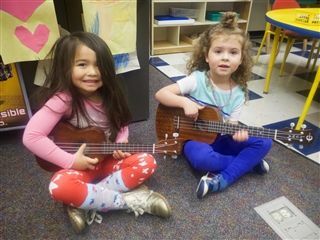 The distinctive notes of ukulele music filled a preschool classroom on Friday, March 10, as middle school students performed for their youngest fans. Jennifer Padberg teaches the ukulele elective to students in grades 7 and 8. She said she and her students were looking for audience so they could perform songs they’ve been learning this semester. 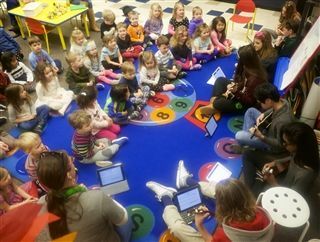 “We thought the preschool and prekindergarten students would really like the music. When I suggested it, it turned out that some of the classes had just finished studying Hawaii, so it was a perfect fit,” Padberg said. The ukulele originated in 19th century Hawaii. Its music is still culturally significant on the islands, and has since gained popularity throughout the United States and internationally. 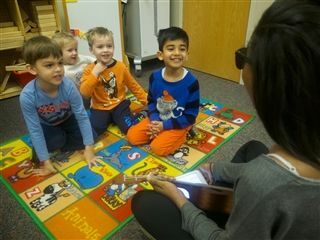 Students in the elective learn to read music, play several songs and get comfortable performing for an audience. 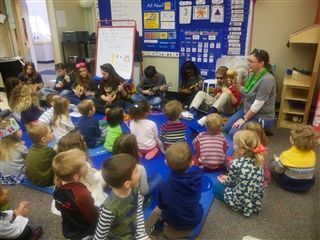 The concert opened with “Aloha Oe,” and included several songs the children could recognize and sing, including “The Alphabet Song” and “Itsy Bitsy Spider.” Students also played solos and Padberg taught the preschoolers and pre-K students about the variety of instruments being played: soprano, concert, tenor and baritone. She even accompanied her musicians with a pair of maracas fashioned from dried gourds grown in the Barstow garden. The audience was engaged and excited to hear—and try—the ukuleles. Guided by the older students, they divided into small groups where they held and strummed the instruments for themselves. “It was so fun! I’m going to learn to play some more,” one aspiring musician said.